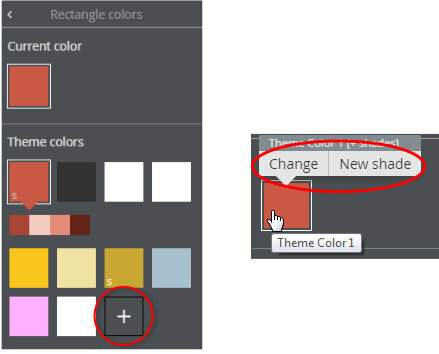 The Color Editor opens when you click the + icon on the properties panel or the Change or New Shade option on the Theme Color context menu. So here I’m editing a Theme Color 1. The black crosshair shows the new color I’ve chosen which is the New red color. I can easily compare it with the Old red color. This is great when making subtle changes to compare against the previously used color. You can edit color names, just tap on the name field and edit. Also you can copy and edit the hex RGB value from the Color value field at the bottom. Or I could select a totally different color entirely by dragging on the hue selector. Here I am creating a new shade of an existing color I’ve called ‘Paler 1’. The X marks the original parent color, so I’m creating a paler version by dragging to the left. The color patches below show the other shades linked to the parent color. If you tap on them they will load into the color editor. The two shade X and Y fields allow you to enter precise numeric shade values (all relative to the parent position). If you want to create a pure tint of a color - that is a mix to white - then just make sure both the X and Y values are the same. The point of linked Shades of colors, is that when the hue of the parent color changes, then all linked shades change in sync.